Once again attendance is limited, and all guests need to pre-register. There’ll be a $20 registration fee per person (if it can walk on two legs, it’s a person 🙂 ). 100% of these proceeds will be donated to Corgiaid. You’ll also get a token good for one hotdog or pizza slice from our caterer. RSVP: Registration is not yet open. (Typically begins two months prior. There’ll be an announcement at that time.) Once you register you’ll get directions (if you’ve never been here, you will need them – the address is not enough) as well as any additional instructions necessary. The event will very likely sell out, but please do go register to be placed on the waiting list. If people can’t come and back out (which always happens), then some slots should open up. Parking: Parking will be in what we refer to as our “back pasture”, which is behind the house to the east. There will be signs and people to direct you. Food Service: The picnic will once again be catered by DogFather catering. Each person registered will get a ticket for one free hotdog or pizza slice. Additional dogs and slices will be available at DogFather’s posted rates. Feel free to bring a side-dish or snacks (though an extra donation to CorgiAid would be just as welcome 🙂 ). Oh, and expect Corgi-thievery – so don’t bring something that would make the dogs sick. Attendance is as your own risk; the organizers cannot be held liable for damage or injury to vehicles, guests, or their pets. Pet owners are responsible for picking up their pet’s waste as best they can and depositing in the receptacles provided. 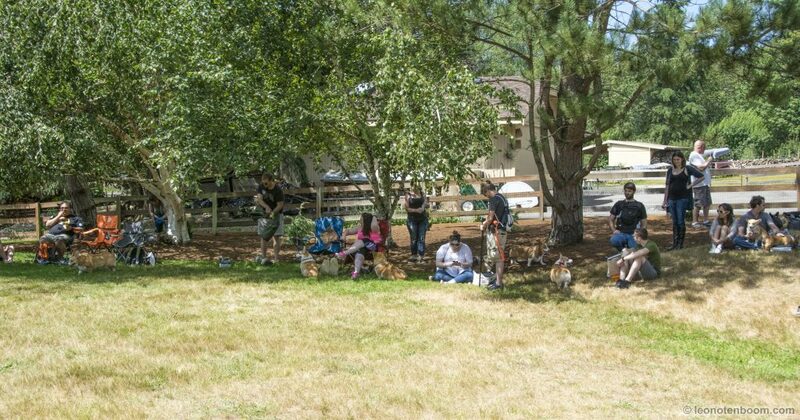 No thrown balls or toys — as a fenced/off-leash event we can’t encourage pack or prey behavior. Please remember that if we ask you to perhaps put your dog on leash or in time-out it’s for everyone’s safety. Even if your dog is simply being exceptionally playful, it can sometimes incite others who aren’t as well behaved. We don’t want 100 dogs to suddenly decide they’re a pack and act accordingly. Cost: $20, per person, pre-registration required. Click for last year’s picnic summary and photos. As always, updates on pnwpicnic.com.